Well long and behold OMG this is the fastest thing I have ever seen outside of a Turbine. I was clocking at 116MPH on a 4S 45c Turnigy graphine. I will tell you it was quit intimidating at first but I got used to it quickly. Also A great tip is to turn up your rudder channel to maximum throw on the radio mine was at 150 you will need it for the tight turns. Half my Club on Long Island NY now owns one. 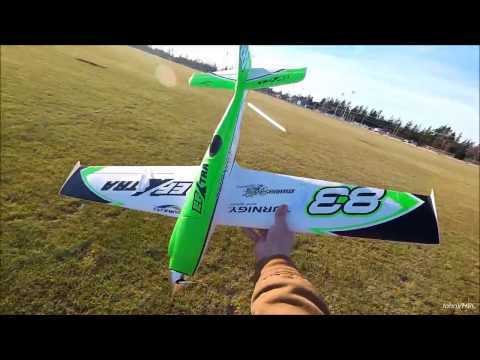 They are very durable and super fun to fly (as most DUREAFLY are). NOTE: This is not a beginner/intermediate flyer but geared towards the intermediate/advance stage of flying. Even on the 3 cell you will still be doing 75+ MPH. No modifications needed buy extra props and also make sure you use the correct prop for the correct battery it makes a huge difference. The smaller black prop for the 4S and the larger grey prop for the 3S. No need to extend servo travel in your radio to get few mm more on the rudder, just screw the ball to the midle hole at the rudder horn. It may saves your servo. I do enjoy giving mine a right thrashing! A 7x6 APC style prop will do fine on 4S. Stiff props do last longer with brake on programming of the ESC!